Tracy Montrose Blair: Why do people have to die? Nate Fisher: To make life important. None of us know how long we’ve got. Which is why we have to make each day matter. I think about this a lot in my more morbid moments, which I have had more of recently. I have spoken about being depressed somewhat openly because I think it’s important to acknowledge that people get depressed. I think we tend to stigmatize people who don’t conform to what we think of as “normal,” which includes people with depression, the transgendered community, and people who experience things most others do not. I am somewhat dismayed by our society’s uncomfortableness with others having non-normative emotions and experiences. I saw several amazing talks by Leon Gersing, aka Ruby Buddha. Seriously, if you ever have a chance to see him speak, DO IT!! The Neurotypical Dance of Shame! 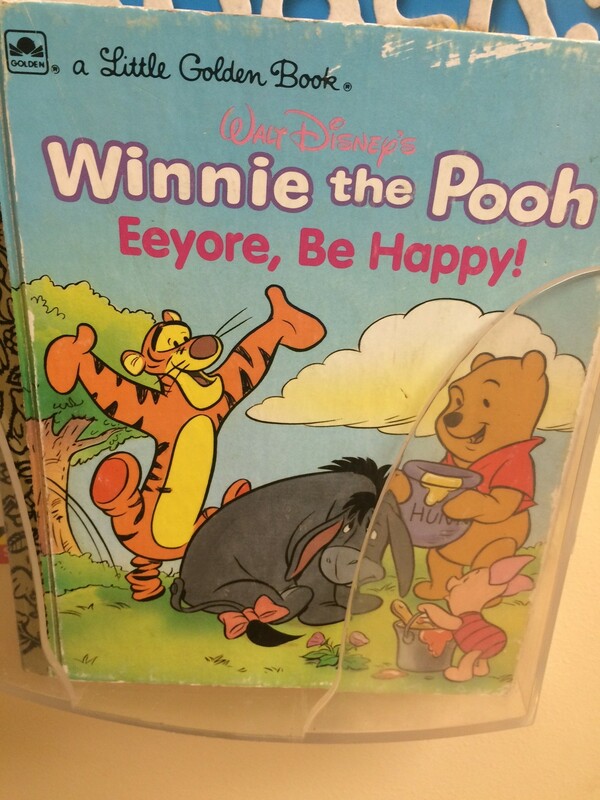 I was at the doctor and I saw this book: “Eeyore, Be Happy”. Eeyore is the perpetually depressed character from Winnie the Pooh. I was rather disturbed by our society’s willingness to ignore his feelings because they make us uncomfortable. We have an idea about how we want people to be and we don’t want to recognize the ugly reality that life is more complicated than we care to believe. 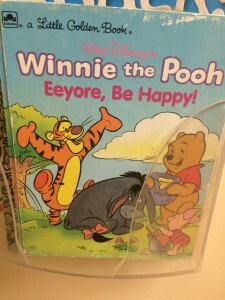 We want Eeyore to be happy because his depression makes us feel bad. We want everyone to be happy. I see similar feelings expressed by introverts who feel like we, as a society, value extroversion so they are supposed to conform to our expectations and feel incredibly uncomfortable with trying to be themselves. I have spoken to a lot of people who feel that their natural emotions and feelings are seen as deviant and threatening who are incredibly depressed because they feel they are not “normal.” I try to do what I can to assure them that they are not creepy or deviant, but there is only so much I can do. I respectfully decline to do so. I do not want to numb my experiences. I am going through a rather traumatic time and I don’t think taking a pill that blunts this experience is the best thing for me. I would rather experience my sadness so that when it alleviates and I feel happy again, it will mean something. I know our society is uncomfortable with melancholy and sadness. I know we want everyone to feel happy all the time and not talk about our various disappointments and let downs. We don’t want to hear about people’s failures even if they learned far more from a failure than they did from a success. I don’t think that’s healthy. I think for happiness to have meaning, you need something to contrast it to. I am not saying I don’t think anyone should take anti-depressants. I know if you are thinking of taking your own life that numbness is probably preferable to thinking that there is no point in going on any longer. I am just saying that it is my choice to not take anti-depressants. I am trying to use meditation and mindfulness to deal with my depression. It is my choice to fully embrace and experience my sadness. I want to experience my feelings in my own way and everyone is entitled to choose how they deal with their own lives. I feel incredibly privileged to be in a position where I can live my life the way that I want. I know many people are not so lucky, which is why I am speaking about this. It would probably be safer for me personally not to disclose this information publicly, but I feel that it is important to talk about it because if we ever want anything to change, we need to acknowledge that a problem exists. I am sick of seeing my friends pretend to be someone else because they don’t feel like they themselves are okay. I would like to change that. I have spent the last month or so working on a project where I am wrapping a legacy C toolkit, libxml2, in Swift. I have created a sample project here where you can obtain wrapper classes written in Swift allowing you to utilize libxml2 into your code without having to touch C.
My job at SonoPlot is to write control software for our robotics systems. One of our included pieces of software is a CAD program for users to use that creates XML pattern documents that that are parsed by our control software so that it can tell the robotics how to draw a pattern. I had wanted to include event-based parsing with libxml2, but that utilizes C function pointers, which are not currently possible with Swift. Clearly, there is a large difference between using libxml2 and any permutation of NSXMLDocument. libXML2 is a toolkit for parsing XML that is written in C. Back when the first iPhones came out, libXML was highly utilized because it was incredibly fast and the first iterations of the iPhone were not particularly powerful. As the iPhone has become more powerful and the number of frameworks has become more robust, libXML2 has fallen out of use. Since it is a C toolkit, you are taking responsibility for your memory management. It wasn’t written for a specific language, so it is rather sprawling and has a lot of obtuse documentation. It’s also rather old. When I was looking into it they had sample code written in Pascal. Basically, as things like NSXMLParser and the use of JSON became more prevalent and easier to work with, there hasn’t really been a need for most people to bother with this difficult toolkit. libXML is included on your machine, but it isn’t included by default in Xcode. It will need to be important and linked to your project for Xcode to be able to see it. Now go to your Targets and find your Build Phases. Find the tab that says “Link Binaries with Library”. Click on the “+” sign to load a new library to link to the project. Search for “libxml2.” There should be two results. Add both of those results to your project. Lastly, you will need to import an Objective-C bridging header into your project. The Objective-C bridging header is a file that exists in this project, so you just need to drag it from the sample project over to your project. A really good README going over this process is here. If any of my steps aren’t clear enough or something isn’t working quite right, use this as a backup for the instructions to hook this up. It can be incredibly obtuse and easy to forget one little step and have the whole thing not work. Also, the way that I verified this worked was to look at a project I got this working on and I searched both the Target and the Project for “xml” to see where I had added search paths and linker files. This is a good way to do a sanity check to make sure that you didn’t forget anything. The first wrapper class I created is the simplest one: LibXMLDoc. In XML, you have a tree that is made up of nodes. In libxml2 all of the nodes are contained in an xmldoc. You need two things from the LibXMLDoc class : a document and a root node. Once you are able to extract the root node, you are able to traverse the entire tree to find anything that you are looking for. Since we are dealing with C, we are responsible for our own memory allocation and deallocation. I had to remember to deallocate the LibXMLDoc when we are done with it. The second class, LibXMLNode, is where we do a lot of the heavy lifting. This class is responsible for finding and extracting values from our XML document. The first property I needed to set up was nodeName. nodeName is going to be the primary way we are going to be accessing and dealing with each node, so this is a pretty important value to have easy access to. Since libxml2 is a C toolkit, the type we are receiving is going to be a C string. The other thing complicating this is that libxml2 is set up to deal primarily with pointers to their node and document objects. We need to take a pointer to a C string and somehow do some alchemy on it to convert it to a Swift string. Swift strings have a method on them called “fromCString” that I was able to use. Also when dealing with C string types, you need to use unsafe mutable pointers. I also had to figure out how to navigate through a C pointer to access the actual values that they were referencing. It will be a parent node that contains children nodes but no value. It will be a child node that might contain a value but has no children. I set up two lazy properties in the LibXMLNode class to deal with these two eventualities: nodeValue and nodeChildren. nodeChildren takes a LibXMLNode as a parameter and iterates through that node’s children until it encounters “nil.” It then returns an array of LibXMLNode objects. The first time I wrote this code, I was getting many more nodes than I was expecting to get. By printing out the array of node children I found that every other node was a node, which mean that if I was expecting five children nodes, I was actually receiving eleven, because the first and last nodes were nodes and every other node in between was also . This was rather inconvenient, so I found a libxml function that checks to see if the node is a node. If it is, the function returns 1. I do a check on each node and if the function returns 0, the node is added to our LibXMLNode array. nodeValue covers the other contingency where you have a node that contains a value that needs to be extracted. Since it is possible to have empty XML tags that do not contain values, this property has to be optional. We need to extract the value and look inside to see if we have anything in there. I used the libxml2 function “xmlNodeListGetString,” which takes a document, a node’s children, and their index as parameters and returns either a C string or nil. If there is a value, we use the code we used in the nodeName function to extract a Swift string, we free the C string, and we return the Swift string. If the function returns nil, we return nil. So I was all excited that I figured all of this stuff out and I was ready to start testing my classes. I wrote a bunch of tests that all failed immediately. While looking over the tests, I realized that every time I tried to access any of the properties on the root node, they were failing because the root node didn’t exist. 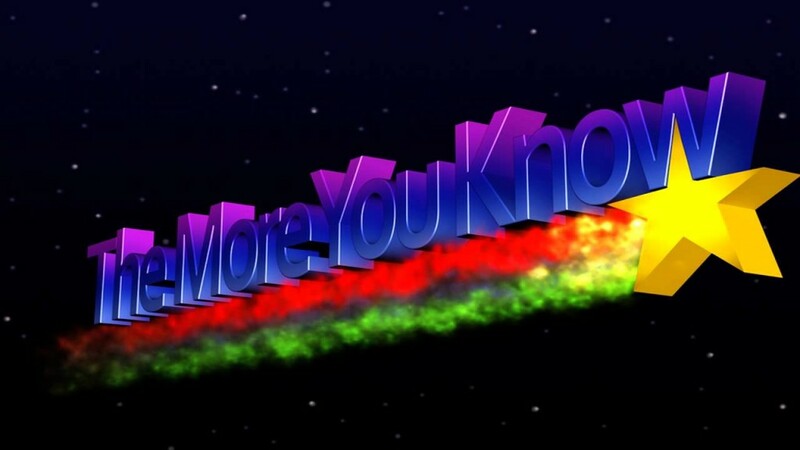 In libxml, the document controls the memory for all of the nodes, not the nodes themselves. Basically the way I was writing the code was that I only referenced the document once, where it gets initialized. From there, since there were no other references to the document, ARC deleted it along with all of the nodes it contains. That was a problem. Since the document contains all of our nodes, we really need it to stick around until we are finished with extracting all of the nodes and their values. We have to create a LibXMLNode instance in the LibXMLDoc class to hold the root node, we couldn’t just have the LibXMLNode class point to the LibXMLDoc class. We had to have them point to one another without creating a retain cycle, so the LibXMLNode class has a strong reference back to the LibXMLDoc class to prevent the instance from being deallocate before we are done with it. I then went back to LibXMLDoc and make the reference to the LibXMLNode a weak reference to avoid a retain cycle. There is still some juggling that needs to be done in order to make sure we are able to prevent the document from being eliminated and that we are able to get the root node. The solution utilized here was to replace the strongly referenced LibXMLNode root node with a private, internal weak root node and a computed property checking to see if this internal root node has been set yet. If it has, it is returned. If it hans’t, we extract the root node, set it to the internal root node, and return it. Since computed properties are basically methods that look like properties, for all intents and purposes we are replacing a strong reference with a weak reference and a method. We are trying to resolve a few things by taking this path. First, we are trying to avoid having the root node and the document deallocate before we can use them. Second, since we are using a class and a class is a reference type, we want to make sure that we only create the root node once rather than having a bunch of instances all pointing back to the same memory location. The last part of this sample application that I want to cover is including XML files rather than accessing them from an internet URL. I have included in my sample project a relatively simple pattern file generated by our CAD program to use as an example. One thing you have to remember to do when you include an XML file with your program is that you have to include it in the application bundle. I have included a convenience function in the LibXMLDoc class called “bundleForResource” that takes the the resource name and returns an NSURL. This can then be passed into the parser where it asks for the URL of the resource. You also have to make sure that your file resource shows up in “Copy Bundle Resources” in “Build Phases.” My original attempt at creating a sample project was trying to make this a command line application, but I wasn’t able to copy the bundle resources (because there was no bundle) and it generated an IO error. The last convenience function I included in the LibXML wrapper classes is the “outputXMLTree” function. This function is recursive and it walks through the document tree checking each node to see if it has children or values. I am using this function in the App Delegate to demonstrate the the classes have in fact parsed the included document correctly. Before attempting to work on this project, I decided I was going to avoid dealing with C in Swift as much as humanly possible. Considering the nature of what we do here, where we use serial communication in C with our control software, that was an incredibly stupid and wrong-headed way to approach things. Yes, it is a little more complicated. It required some more work, some tenacity, and some help from my boss who has been around the block a few more times than I have. As much as part of me would like to not think about it, C isn’t going anywhere. I want to work with micro controllers and firmware in the future and deciding not to get C to play nicely with Swift is basically a non-starter for the projects I would like to do. Even if you think that XML parsing is as boring as dry toast, hopefully the code will help you with figuring out how to integrate older C code into your projects or at least give you a clean way to add better XML parsing to your applications. Again, the sample code associated with this post is here. Hit me up on Twitter if you have any questions about it.